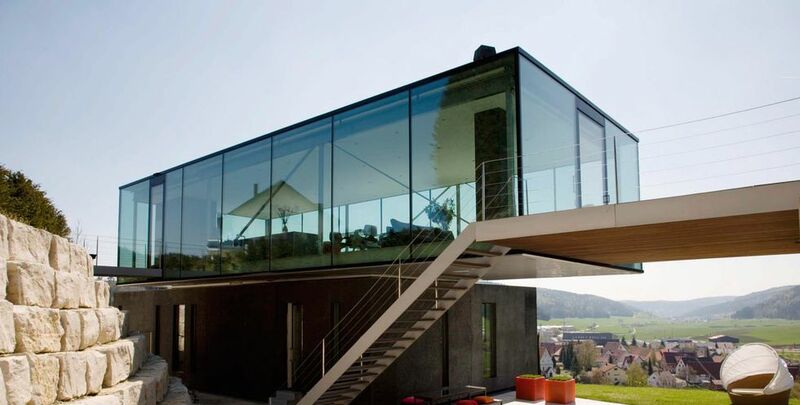 The private house is split up into two cubic building parts. 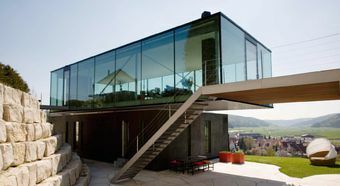 At the top the façade is made of glass panels of 2.36 x 3.63 m in size, and the lower part is black concrete. Not only were clean construction materials used but also, and above all, attention was paid to energy efficiency. The house generates its own energy through the use of geothermal energy, a photovoltaic system and mechanical ventilation. 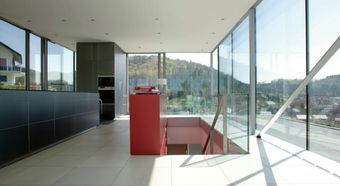 Maximum transparency is produced thanks to the glass construction of the main part with a 360° panoramic view. The elegant Flat Design in stainless steel fits perfectly into this ambience. The intelligent JUNG KNX system ensures maximum comfort and convenience.